carbohydrates. 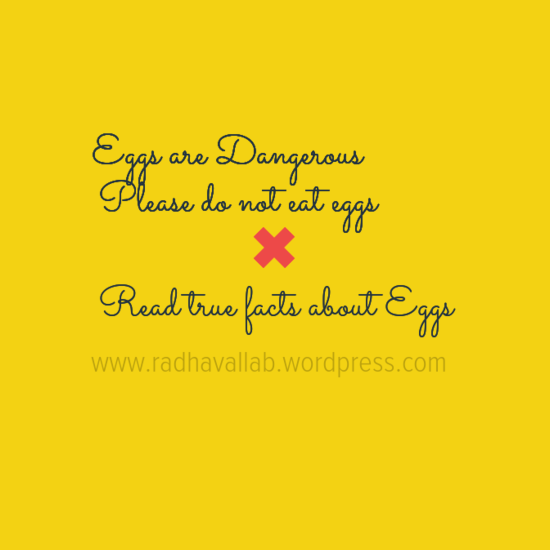 The eggs are full of poisonous and harmful elements. Egg is the cause of several serious diseases; the high cholesterol content increases the risk of heart disease. The hens eat sputum, phlegm, nose secretions, worms, germs and other such filthy things. The eggs are produced from these things. Can egg increase the mental and intellectual quality of a person? Eggs contain high amounts of cholesterol, which causes high blood pressure and kidney problems. Frying an egg increases its cholesterol level further. mg cholesterol, which is dangerous for the heart. Nobel prize winner Dr. Brown and Dr.Goldstin have proved that eggs contain high amount of cholesterol and hence increase the risk of heart attack. The egg white contains Evidin, which causes eczema and paralysis. which makes the person diseased. poisonous epidemic only because of salmonella bacteria. phlegm, which imbalance the nutrition’s in the body and become the abode of dieses. Bile and pancreatic juices of egg are ineffective on egg white. Therefore 30 to 50 per cent of egg is excreted without being digested. This is the view of Professor Akoda of England. According to Dr. E.V. Mekkalam the eggs do not contain carbohydrates and the amount of calcium is also very low, hence it decays in the stomach. vitamins. Especially vitamin B complex and vitamin C.
different types of disease whether eaten raw or in any other form. – The hens are given injections of special hormones for egg formulation. – The male chickens are made to sit under the hot Sun and are not allowed to sleep to make them young quickly. – More hens are fitted in to the farms, where they cannot flap their wings, they bite one another and get injured. – The hens are forced to sit in the sheds throughout the day. – The wings and beaks are chopped off with the help of hot metallic instruments and machines.This hard truth was mentioned in the world-renowned book, height for a new America, written by John Robins. – Is it not foolishness to eat eggs containing 13 per cent protein and sacrificing vegetable food items containing 22 to 43-pr cent protein? – Is it not stupidity to eat eggs, which are responsible for generating serious diseases instead of nutritious and healthy vegetarian food. – Is it good to eat eggs 173 calories or vegetarian food containing 327 to 432 calories? – Are we not encouraging violence and cruelty by eating the poor creatures that are subjected to different kinds of cruelty? So Much Violence is produced by the killing of animals, where do you think the reactions to this violence goes? It comes back to us in so many ways, such as the form of neighborhood and community crime, and on up to world wars. Violence breeds violence. people. This is the reaction of nature for the immense cruelty produced by humankind. केवल ऊपर या नीचे ही हिला सकते हैं ..
जबकि शाकाहारी जानवर व मानव अपने जबड़े चार संभव दिशाओं में हिला सकते हैं… इससे पता चलता है कि हम शाकाहारी प्रवृति वाले जीवधारी हैं..
३. जानवर दो तरह के होते हैं… एक जो पानी पीने के लिए उसे चाटते हैं यानी जीभ से पानी पीते है ,जैसे कुत्ता, बिल्ली, शेर जो कि मांस खा सकते हैं..
और दूसरे जो पानी पीने के लिए उसके घूंट लेते चूसते और निगलते हैं.. जैसे.. गाय, हिरण, घोडा आदि जो कि पूर्णतः शाकाहारी होते हैं..और हम भी दूसरी श्रेणी से सम्बंधित हैं..
४. यदि आप एक विक्षिप्त शव देखते हैं.. जिसके आस-पास बहुत सारा रक्त हो..